Tangaroa Terrace (the quick service restaurant adjacent to Trader Sam’s at Disneyland Hotel) just got a new look, and a new menu! It has reopened after a refurb as the Tangaroa Terrace Tropical Bar and Grill. It is still a quick service restaurant, but now it also has a bar that you can sit at to enjoy a drink, or walk up and order and take back to your seat at Tangaroa Terrace. Before Tangaroa Terrace had standard tables and chairs in their seating area, and no bar. Now, they added some lounge areas with tiki tables, couches, and chairs. This new format makes it so easy to relax! You don’t have to wait inside Trader Sam’s to get a drink, and now with this extra ordering area for cocktails it has made both Tangaroa Terrace and Trader Sam’s less congested. At the walk-up bar, you can also order Dole Whips and Dole Whip floats! 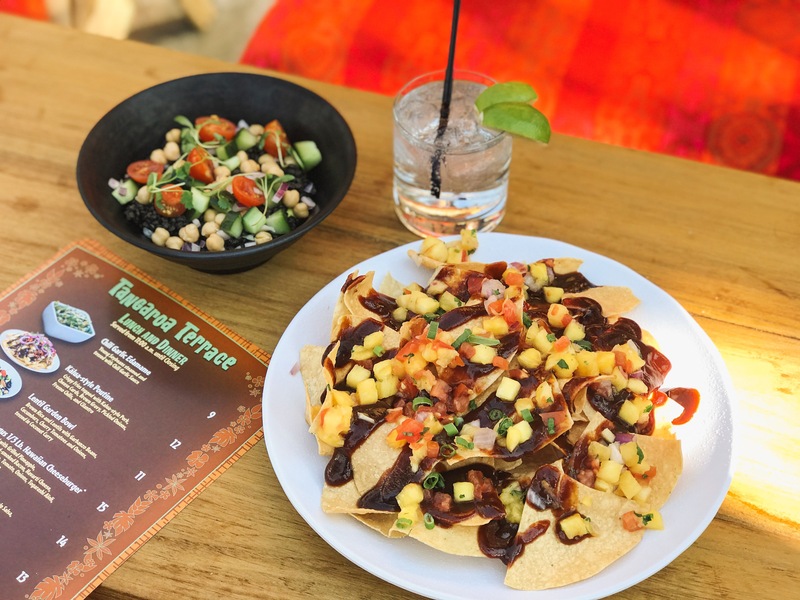 So order some food inside Tangaroa Terrace, grab a drink at the walk-up bar, and grab a seat on a tiki couch among the palm trees and feel the nice Southern California breeze! Kalua-Style Poutine, ordered without pulled pork. For more Disney food guides from The Healthy Mouse, click here.